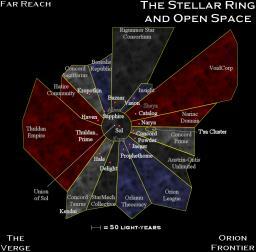 This graphic map is a reproduction of the Stardrive Stellar Ring Map. It is completely done with Paint Shop Pro and is 1,024x1,008 pixels in size. Any requests for larger or smaller versions may be made to twilight@snowhill.com and may be answered time permitting.